Charlie Kane’s family are searching for his missing memorial sign. 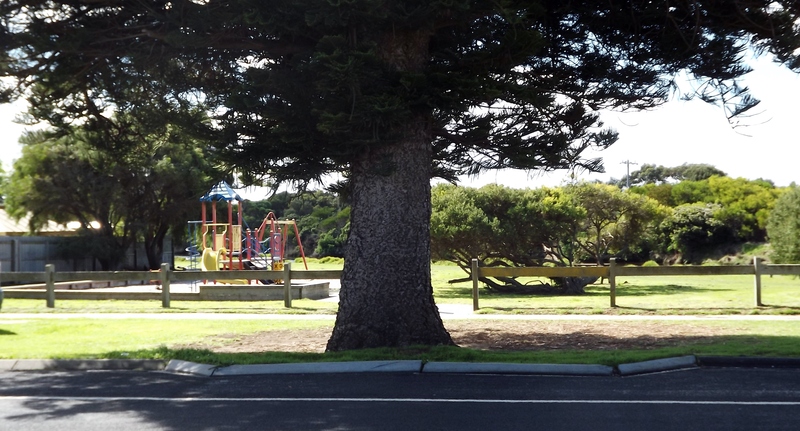 The former South Warrnambool identity died in 1973 and a piece of land between the Merri River and the South Warrnambool Kindergarten was named Charles Kane Memorial Park in his honour. In recent years Kane’s memorial sign has disappeared and his family want to know why it was removed and are calling for it to be reinstated. Dianne Rae, of Warrnambool remembers her Uncle Charlie’s memorial sign, and says it was put there to represent his untiring work for the South Warrnambool community. “I am wondering why the sign has disappeared. If it was vandalised why hasn’t it been put back up?” Mrs Rae asks. Great-niece Virginia Lee, of Foxhow is not impressed the sign has not been replaced. Charlie Kane considered himself ‘South born and bred’ and dedicated himself to improving living standards in South Warrnambool. Christened Charles Patrick Kane, the self-educated bachelor was a driving member of the South Warrnambool Community Association (SWCA), a Justice of the Peace and life member of the Warrnambool Fire Brigade and Warrnambool Rowing Club. 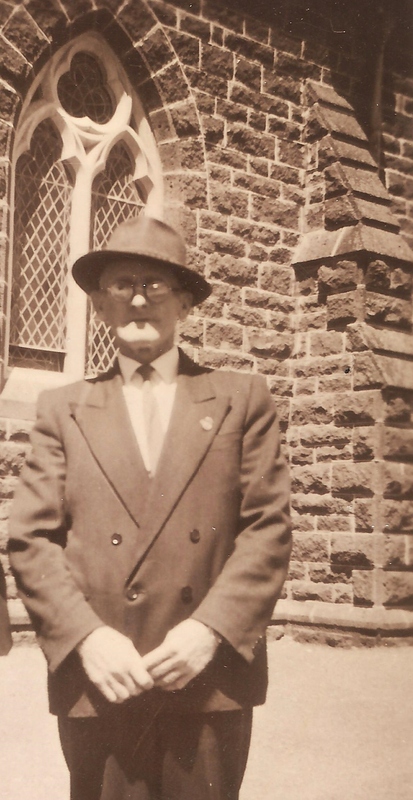 Mr Kane was also a self-taught artist and keen gardener, attracting plenty of attention to his little cottage which still stands at 7 Pertobe Lane. 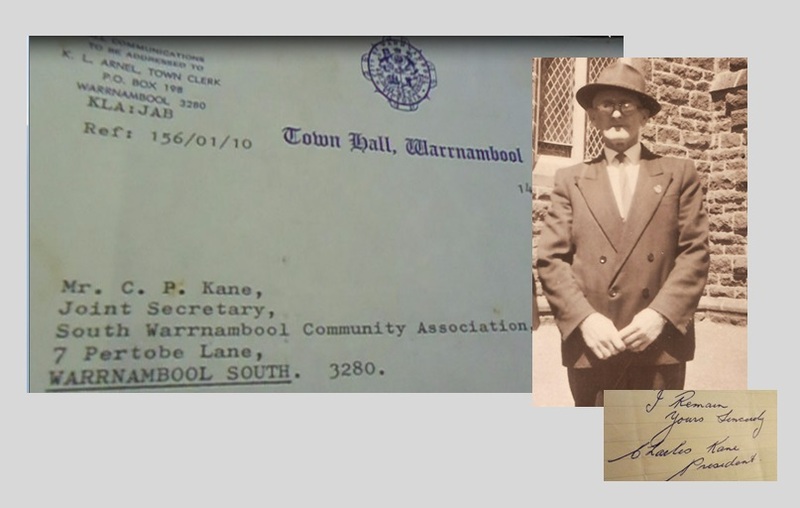 South Warrnambool Community Association records show Charlie Kane served as inaugural President as well as Joint Secretary. The Association was formed in 1957. Charlie Kane served in the Association from the start and was well known to South Warrnambool residents including the Ferrier, Egan, Stephen, Edwards, Pickett Mitchell, McCullough, Sheppard, Hunter, Maguire, Tinker and, Linford families. Later SWCA members and officers included those of the Hose, McDowell, Johnstone, Hume, Wilson, Lambert, Jenkins, Hand, Paroisseine, Farrell and Main families. 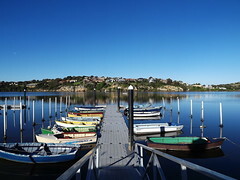 SWCA records show the Association employed a co-operative approach in it’s relationship with the Warrnambool City Counci. In October 1962 Councillor S. L Price said “the Association is doing a wonderful job”. SWCA successfully lobbied for improvements to local roads, footpaths and bridges. Safety crossings were installed for school children, women’s public toilets erected near the beach and maintenance improved on toilets on the viaduct road. Pedestrian refuges on Pertobe Road and traffic islands for safe crossing were achieved along with improved lighting. The removal of boxthorn that harboured vermin and the reduction of weeds and unkempt grass as a fire hazard were also Associations achievements, especially along the Merri River. From 1963 an all-out campaign was launched by SWCA against rubbish dumping in South Warrnambool. Residents were fed up with dumped cars and cleaning up rubbish litter from trucks and trailers en-route to the old tip site at Thunder Point. SWCA lobbied for better sanitary collection times and for improvement in water supply to homes. Community access to the river between Stephen street and the Merri River was lobbied for along with a clean-up of the old tramway. Street names and signs were made consistent with other areas of Warrnambool and SWCA pressed for a police station, post office and public phones to be established. The South Warrnambool Kindergarten was Charlie Kane’s favourite project and upon his death a working bee was held at the adjoining park. 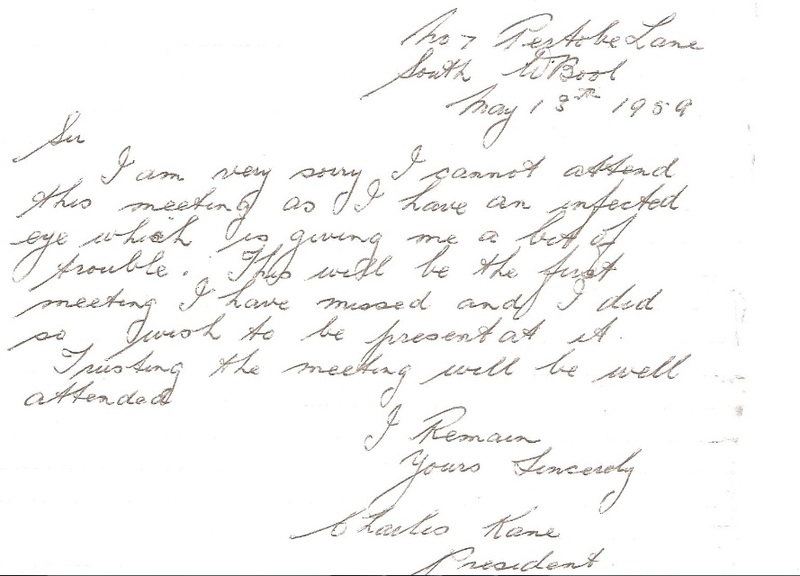 South Warrnambool Community Association made an application to Warrnambool City Council for the land between the Kindergarten and the Merri River to be named the Charles Kane Memorial Park which was granted at a meeting of the Committee of the Whole Concil on the 9th of July 1974. Charlie Kane and his mate A.C Morton, a local school teacher, were ‘leading lights of the communist party in Australia” says Warrnambool historian Doug Heazlewood. Mr Heazlewood grew up in South Warrnambool, down the road from Charlie, and is making a special study of both Kane and Morton’s lives. “Charlie always wore a hat,” Mr Heazlewood remembers. 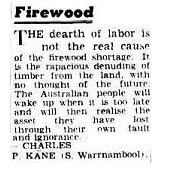 Charlie Kane seemed a simple man but was both intelligent and articulate. From his little home in Pertobe Lane he made his way each week to the Warrnambool Woollen Mill where he worked with brothers Harry, Barney, Martin and Bill Kane. 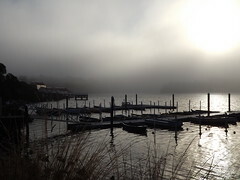 Niece Dianne Rae said Charlie also liked to partake in the illegal gambling held in a big tin shed down on the breakwater. He was a keen footballer like his brother Martin and in earlier years played in fundraising matches held between staff from the Mill and men from the Lady Bay wharf. Charlie’s father was Bernard Kane and his mother Elizabeth nee Sheedy (of Killarney, Vic). Charlie’s youngest sister Agnes Kane died in infancy and his two other sisters were Margaret “Madge” Elliott of South Warrnambool and Gladys Kane of Abbotsford. Before Charlie’s involvement in the SWCA he spent years writing letters to newspapers supporting issues such as worker’s rights, environmental degradation and sustainable local production. Charlie’s thinking was undoubtedly influenced in part by his maternal grandmother, Mrs Ellen Sheedy (nee O’Connell) who moved to South Warrnambool from her farm at Killarney in her last years. From Mrs Sheedy Charlie would have heard plenty of his grandfather Patrick Sheedy, the. Eureka rebel who had earlier fled Tasmania’s convict system though still under sentence for his White Boy activities in Ireland. Charlie Kane was one of the driving forces of the South Warrnambool Community Association. The working-class bachelor is remembered by family and South Warrnambool residents for his gentle kindness. Charlie’s family would like to see his Memorial sign reinstated to continue to honor his work to the South Warrnambool Community. A better friend no one could find. (Memorium notice for Charles P. Kane by the Knights Family of Elliot Street, South Warrnambool).